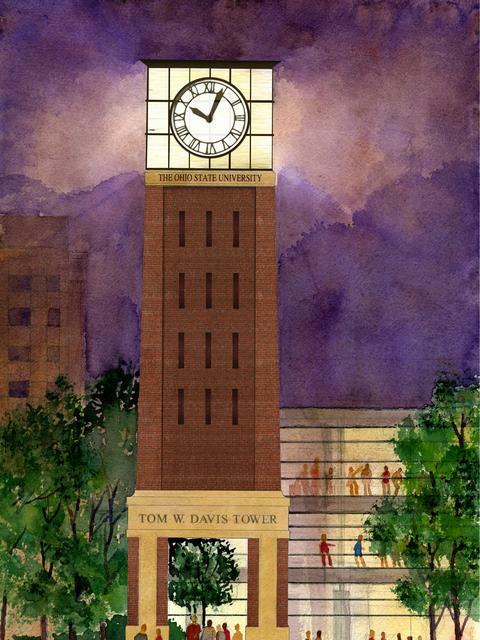 The plan for the Tom W Davis Clock Tower was first circulated in the middle of 2016 (here's an article from BizJournals about it from that time). It would be a 75 foot tall tower with an analog clock on the top and a large video screen underneath. It would be funded by a donation, earmarked specifically for it, coming from Tom W Davis in the amount of $1.4 million. It’s designed to be an iconic structure in that part of the university ... we’re thinking, ‘Meet me at the tower’ is going to be a common thing. 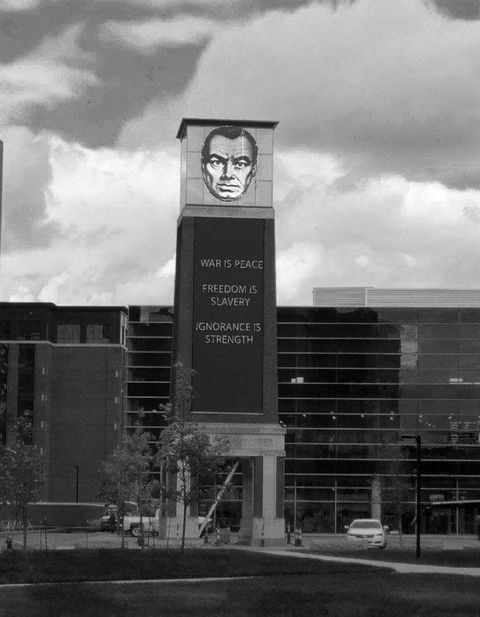 In the student newspaper, The Lantern, a satirical editorial lambasted critics for not recognizing the true value of the Tower, calling attention to the juxtaposition between the Tower's construction and Ohio State's expansion eastward across High Street. ... this necessary addition to campus is one of the best things to happen to this university. Campus watering holes like The O Patio & Pub and Toos Under High will be gone soon and students will need places to gather. A 75-foot clock tower is the perfect way to fill this void. Once the tower was completed, the brightness of the screen drew criticism as well. 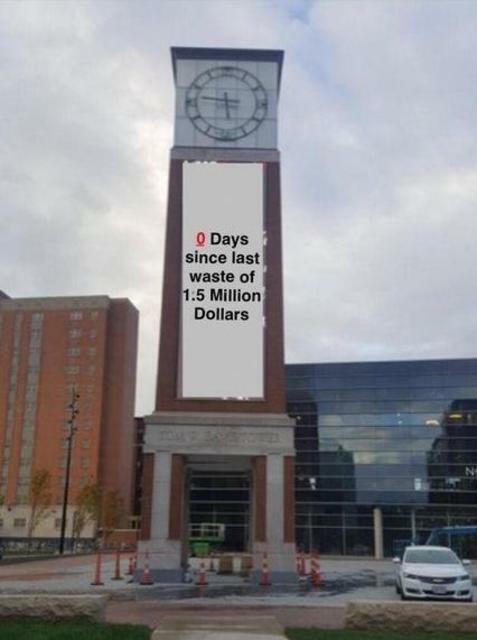 Despite all the complaints, I think the best critique of the Tom W Davis Clock Tower came from the tower itself. The saga of the Tom W Davis Clock Tower is interesting to me because I think it illustrates a distrust of authority and desire for authenticity within people my age. The story above is one that shows young people wanting (naively?) genuine improvement on OSU's campus, perhaps in scholarships to provide more access to the university. When they got responses like the one I quoted from Student Life - that the tall, impersonal Tower would eventually become a meeting place, a campus fixture - they looked at the landmarks they were losing east of High and saw a disconnect. They saw a lack of authenticity in that response. You can't be pulling down well-loved landmarks and expecting someone to believe you when you say you value them. You can't just build one to replace the ones that were lost. 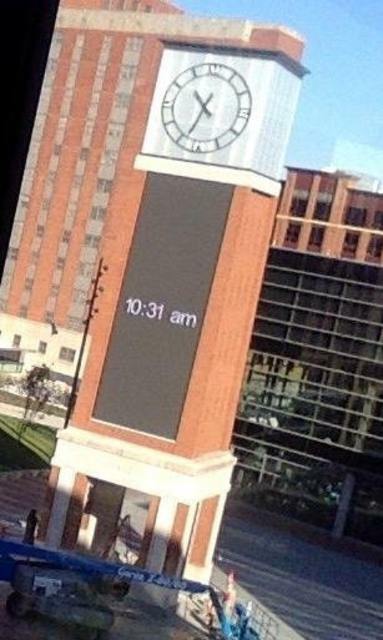 No, there must have been some other reason to erect the Tom W Davis Clock Tower. To their credit, OSU's students saw through the half-truths. They satirized the unnecessary expenditure. They satirized the official response. They satirized the Tower itself. And despite what was lost to OSU's eastward expansion, and that business continued on as usual, that spirit hasn't been broken. I still see the desire for a more genuine, transparent administration out there. Politically, we need people who will question authority, and won't roll over and stop pushing when they get the standard cookie-cutter official response, and when the administration gets its way again and again. If our universities are producing that kind of individual, they're doing alright. I'll leave you with this video about the Tower from Fishbowl Improv, an OSU student improv comedy group.